That is exactly what the Madswimmer group is planning to do with another one of its uniquely challenging and exotic charity swims. Their charity events range from high-altitude swims to cross-border swims, from the Red Sea to the Bering Strait. Nicolene Steynberg explains, "We are awaiting a report from an expert regarding the current speeds, suitable access points, and best dates for the attempt on our full-out plan along the Agulhas Current in the southwest Indian Ocean on the east coast of South Africa. Our idea is to use the current to give swimmers speed and to raise awareness of the Great White Shark. The swim will start near the Port Shepstone Coast, 15 km from the shoreline where we will swim 100 km with the current that moves at 5 knots." Madswimmer estimates that if they add the speed of the Agulhas Current (9.26 km per hour) with their estimated swim speed of (3.35 km per hour), they can swim at a cumulative total of 12.61 km per hour. "This means we can possibly swim a 100 km swim in 8 hours." We are in contact with the Shark Board and other experts who will help us take all possible care to be safe. Madswimmer really does proper homework before any big swim." Illustration above is courtesy of Science Magazine (Underwater probes detect ‘sea cyclones’ off coast of Africa). 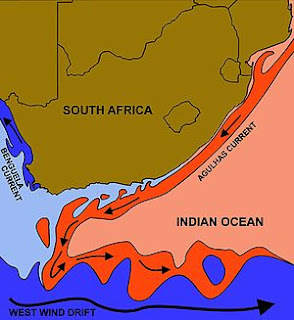 The course of the warm Agulhas Current (red in the diagram above) is along the east coast of South Africa that is formed by the confluence of the warm Mozambique and East Madagascar Currents, which meet southwest of Madagascar. "The Agulhas Current off the southern coast of Africa is one of the world's fastest moving ocean flows and likely responsible for enormous rogue waves that sink supertankers without a trace. ".